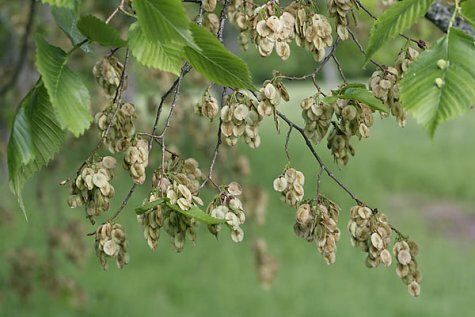 The elm and the white elm are in the same family, Ulmus, and quite similar. City people certainly meet them more often as ornamental trees than in forests. Forests dominated by elms make up some 10 hectares of Estonian forests but splendid solitary trees grow in all Estonia. Henrik Relve has very fittingly characterised the leaves of the trees in his book "Puude juurde - To the trees“: "The upper surface of the leaves of the common elm is rough and bristly as the chin of a man unshaved for some days. But the upper side of the white elm leaves are smooth as a maiden’s cheeks“. The fruits are set in clusters on the trees and ripen early. The fruit is a brownish samara. In the centre is a nutlet surrounded by a broad wing. The asymmetric leaves are worth a closer look. For ornamental purposes a number of interesting cultivars have been developed.